Despite my cynical demeanour, when I heard on the radio that the HFEA has decided that we ought to allow the creation of human-animal hybrid embryos for the purposes of experimentation, I thought I must have mis-heard it. After all, I'd seen that they were running a consultation exercise, and the period of consultation wasn't over... And then I heard the report again. ...so I went to have a look. No, the website still claims to be "consulting" the public. And will continue consulting until 20th July 2007. However, in the meantime, they have apparently made up their minds already: the experimentation will be allowed, because the scientists said that they need to do the research. Hello people. Scientists always need to do research. They will always push the boundaries to see "what will happen if..." It's in the job description. Just because something can be done, doesn't mean that it should be done. In case anyone else is interested, the person to phone is Helen Coath, Policy Manager. Tel: 020 7291 8238 Email: hybrids@hfea.gov.uk Let me know if anyone bothers to reply. UPDATE 1: Ms Coath (according to her answerphone) is out of the office until May 31st. I've emailed, and will have another go at phoning when I get back from Lourdes. All of them. Every single one. I'm not going to pick. It's the same woman in each, after all! Crowned by the hand of thy Saviour and Son. Mary Immaculate, tender and strong. make of our weakness a proof of thy might. Mary Immaculate, Mother of God. There is something haunting about the tune: and looking it up, I discover that it was written by Bach. 'Nuff said! This is the easiest question to answer: Lourdes ! Before I went the first time, I was told that it was too commercialised. Rubbish. Every town has shops: fact of life (hey, we all need to make a living!). Shops sell things. In Lourdes, the shops sell rosaries, medals, statues and holy pictures. There are worse things to sell. If that's being too commercialised, then we need more of it. 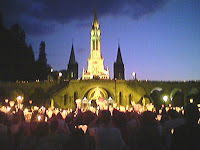 I am drawn to Lourdes because I have been seriously ill several times in my life, and at one time was contemplating having my leg amputated, as it was better than a life of constant pain. Through the grace of God, prayer, and a good surgeon, I was spared that, and I am now able to walk without crutches. The scientist in me rejected the idea of miracles: I assumed that they were events happening to credulous people combined with a lack of medical knowledge. I now know that the miracles still occur, but that the scientific examination of miracles by the Catholic Church is more rigorous than the evidence used to judge any other area of scientific endeavour. Peer review is sufficient to get work published in a scientific journal; miracles have to be examined by scientists who don't accept the existence of God. All of them... but most especially the Rosary. Who to tag... hmmn. 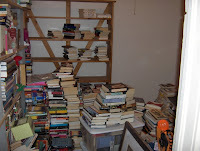 Last time it was restricted to this side of the pond (I was being charitable, you understand!) so this time I shall go global: Ma Beck, the Catholic Caveman, Owl of the Remove and Catholic Mom in Hawaii. UPDATE: Fr Paul, the Great Gable in the Lune Valley wants to be tagged too. OK, tagged. ...but not for me. Newhousenewjob has heard that there's money available for farmers who don't rear pigs. So she wants to get a piece of the action... or inaction... whatever! It was incredibly funny, so I suggest you read it for yourself HERE. Or, to give it its full title, "Feast of the Rant that today is not Ascension Thursday." Curt Jester sends his commiserations on dumbing down. It is absolute madness. The bishops claim that it makes it easier to observe the Holy Day of Obligation by moving it to the Sunday, and so more people would be able to observe the feast. Balderdash. Sunday is already a Holy Day of Obligation. You're not going to get more people going to church on the Ascension if it's Sunday. The people who make the effort to go on a mid-week Holy Day of Obligation will already be going to Mass on Sunday. 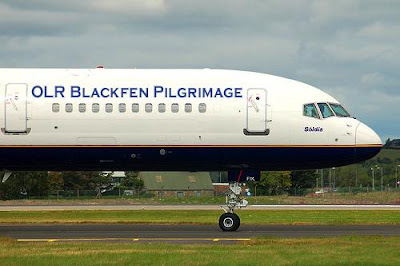 All that has happened is that the Bishops have effectively said, "Oh dear, no-one goes to Mass on a Holy Day of Obligation, so, ok, lets take away the Obligation... and the Holy Day bit..."
...I'm too tired to cope with a computer which is throwing a hissy-fit. I'm going to bed! 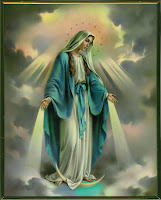 You are 100% knowledgeable about the Blessed Virgin! You are truly devoted to the Blessed Virgin Mary! You most likely pray the rosary daily and quite possibly have consecrated yourself to Mary. Did you know that St Alphonsus Liguori said that devotion to the Blessed Virgin Mary is a sign of predestination? I have been wearing a mantilla since about Summer 2005, maybe slightly earlier. I took private vows in 2002, dedicating my life to God as a woman in the single state, living and working in the world. Looking back, I feel that my understanding (and love) of Our Lord in the Eucharist was cranked up a notch. I became more aware of trying to be properly disposed when receiving Holy Communion, not only through regular Confession and daily prayer, but also in my outward manner, to be aware that I was receiving Our Lord, and to be more reverent in my movements. On being told that this was most definitely not the case, I examined my reasoning. 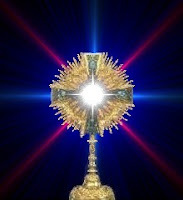 I wanted to show reverence in the presence of the Blessed Sacrament. I wanted to make a deliberate act to remind myself in whose presence I was, and to indicate that I wished to shut out all outward distractions. And I wanted to show humility before Our Lord... So, did I believe that God was any more present at the Classical Rite than at the Novus Ordo? Absolutely not: I've said before that I love the Novus Ordo when it is carried out with reverence and love (and in accordance with the rubrics!) And so, the conclusion was inescapable: I would wear a mantilla whenever I was in the presence of the Blessed Sacrament. Having made the decision, my next problem was finding a mantilla. Not an easy task. And I had no idea about materials, sizes, patterns... I knew I'd be able to get a mantilla in Lourdes, but that seemed ages away, and I wanted to get going. A priest who was a chaplain at my school went to Rome - he promised to get me a mantilla: unfortunately, the death (and funeral) of John Paul II meant that black mantillas were not to be had for love nor money... Luckily, a woman who wore a mantilla at the Classical Rite Mass was able to give me a spare, to start me off. In Lourdes, I was able to get a look at the mantillas on sale in every shop. 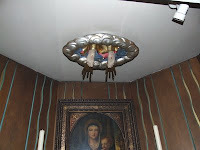 Unfortunately they were either viscose-and-polyester monstrosities which wouldn't stay on without at least three hair clips (and were badly made to boot) or they were stiff netting with pictures of St Bernadette and Our Lady (and the word "Lourdes") appliquéd in felt. 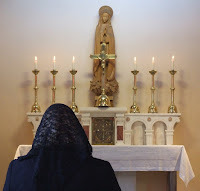 And in case anyone is unclear as to why any woman these days would want to wear a mantilla, check out the posts I've written before: Wearing The Mantilla and More On Mantillas. Presenter: "Luke, you wanted to come in before when I suggested that he painted a pretty conventional picture...?" Reply: "It's not surprising that the Pope concludes that Jesus is the Son of God..."
Twitch of the mantilla to the American Papist. You've heard of Confession Online? All fine-and-dandy, but there is always the little problem of the temporal punishment which remains after absolution has been given. So, now you can put those Purgatory panics to one side - there is a website where you can arrange a Papal Indulgence, at the click of a mouse, and the passing over of some plastic! Simply click the type of sin, who you sinned with (or against) and the price of eternal salvation will be speedily calculated... More information can be found HERE. I am a very proud and happy bunny. 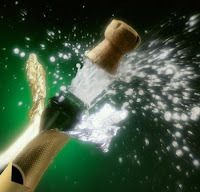 Today is my first blogiversary (see the Hermeneutic of Continuity for reasons why it's not a blogniversary!) I picked an excellent day for it too - the anniversary of the first apparition of Our Lady at Fatima! Looking back, I see that on my first day, I had three posts: Welcome to my Blog, an Inclusive Language Rant and a post on Unfortunate Lyrics. "After reading several excellent blogs, I decided that the chance to rant about my particular pet hates (I have many) was just too good to miss, and so here I am. I have no idea whether anyone else will find it interesting..."